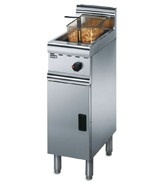 The electric free standing fryers supplied by Catering Appliance Superstore represent a broad range of fryer features to meet the demand of different catering businesses. Single basket and double basket fryers are available, either using the same tank or with separate tanks to avoid cross contamination of foods, and to allow different frying temperatures. Our guide to fryer purchase will take you through the basic fryer types and point out some useful features, and can help you make the right choice for your business. You should expect more expensive fryers to come with efficiency features like built in filtration, and have more power for greater temperature recovery.